A latest job notification with name as MHA Recruitment has been circulated by Ministry of Home Affairs to inform the Motivated & dynamic Indian Nationals for the 69 unoccupied posts of Supervisor, Assistant. Eligible Contestants can apply for MHA vacancy by submitting their applications through offline mode before last date which is Within 60 Days. Monthly Remuneration: After appointment of the appliers, the organization will pay to them Rs. 9300 - 34,800/- With 4200/- Grade Pay. Contenders the first and necessary step is to visit the official site of the organization that is http://www.dcpw.nic.in. This will open a list of the links having latest openings and candidates have to select the most appropriate link which will open the complete advertisement having further details regarding MHA Vacancies. 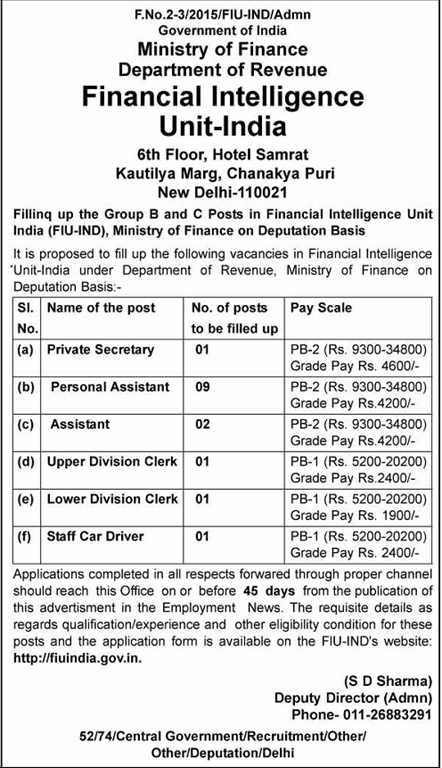 Click Here For MHA Job Notification Link. A newest career advertisement titled as MHA Recruitment has been recently advertised by Ministry of Home Affairs to inform the Eligible and hard working Job seekers for the 27 Vacancies of Dispach Rider. Eligible Job searchers can apply for MHA vacancy by filling offline application form till the last date that is 31st May 2017. Pay Scale: Those applicants who will be recruited successfully against MHA they will attain salary of Rs. 5200 - 20,200/- With 1900/- Grade Pay from recruiting organisation. First of all contenders visit the official website which is http://www.dcpw.nic.in. Deadline to Submit Hard Copy of Application Form Is : 31-05-2017. An employment advertisement in regard to Parivahan Vibhag Ambala Recruitment has been disclosed by Parivahan Vibhag Ambala. Enthusiastic and talented Job appliers can submit application form through online mode for the 20 Vacancies of Stenographer, Diesel Mechanic till the last date that is 10th April 2017. First of all contenders visit the official website which is http://www.apprenticeship.gov.in. This will open a list of the links having latest openings and candidates have to select the most appropriate link which will open the complete advertisement having further details regarding Parivahan Vibhag Ambala Vacancies. Dead Line For Apply Online : 10-04-2017. Date for Interview : 11-04-2017. Click Here For Parivahan Vibhag Ambala Job Notification Link. Andhra University is looking for the Desirous and brilliant Job finders for the 09 unoccupied posts of Project Assistants, Data Entry Operator. Recently, Andhra University has liberated A newest career advertisement with name as Andhra University Recruitment. To complete this recruitment process Candidates who wish to grow their career in government sector can attend walkin interview on 13th April 2017 at the given venue. Qualification Details: Those job hunters have done the 10th / Graduation Degree / Post Graduation Degree from a recognised University or Institution may apply. Salary & Pay Band: Selected aspirants for Project Assistants, Data Entry Operator will get the salary pay band of Rs. 30,000/- (Post 1), Rs. 13,800/- (Post 2), Rs. 8,000/- (Post 3), Rs. 5,000/- (Post 4). Job seekers are interested to apply for above mentioned positions firstly they need to go through the official website that is http://www.andhrauniversity.edu.in. Walk in Interview Held On : 13-04-2017. Click Here For Andhra University Job Notification Link. Job finders can also get latest updates about Andhra University Vacancies by bookmarking this page using CTRL+D. A latest job notification as NIPHM Recruitment has been transmitted by National Institute of Plant Health Management to inform the Result oriented and hard working Job seekers for the 05 vacant positions of Joint Director, Officer, Financial Advisor. Eligible Job seekers can apply for NIPHM vacancy by submitting their applications through offline mode before the time limit that is 19th April 2017. Qualification: Those candidates are having minimum qualification as Candidates who are willing to apply for NIPHM jobs must posses Post Graduation Degree from any recognized board or institution can apply. The maximum age for the candidates who are going to apply for Jobs is 55 Years (Post 1), 50 Years (Post 2), 45 Years (Post 3,4), 35 Years (Post 5). Salary to Employees: Applicants who will be selected successfully against this recruitment they will attain impressive and satisfying salary of Rs. 78,800 - 2,09,200/- (Post 1), Rs. 67,700 - 2,08,700/- (Post 2), Rs. 56,100 - 1,77,500/- (Post 3,4), Rs. 44,900 - 1,42,400/- (Post 5) from recruiting organization. A Written Exam, Interview will be conducting by National Institute of Plant Health Management to select candidates for above stated posts. Last Date to Submit Filled-In Application : 19-04-2017. Click Here For NIPHM Job Notification Link. District Court Gurugram has broadcasted A latest advertisement as District Court Gurugram Recruitment to inform the Ambitious, fascinated and proactive Job seekers for the 17 vacant positions of Stenographer, Peon. Eligible Job searchers can apply for District Court Gurugram vacancy by filling offline application form before the time limit that is 11th April 2017. Education Needed: Job seekers should have completed the education as 8th / Graduation Degree with good academic records from well recognized Board/ University/ Institute as per the applied posts. The candidate’s age should be in between 18 to 42 Years As On 01-01-2017. Salary to Employees: Those contenders who will fulfill the required eligibility criteria for District Court Gurugram Vacancies will get a monthly consolidated of Rs. 4440 - 7440/- With 1300/- Grade Pay (Post 2) as per the rules of the organization. Application Has To Be Sent Latest By : 11-04-2017. Click Here For District Court Gurugram Job Notification Link. A latest job notification titled as BMC Recruitment has been disclosed by Bhavnagar Municipal Corporation. Eligible and hard working Aspirants have to submit the form through online mode for the 27 unoccupied posts of Clerk, Assistant, Instructor on or before the end date that is 13th April 2017. Education Criteria: Candidates must have completed the 12th / Diploma / Graduation Degree or its equivalent with good marks from a recognized University / Institution. Aspirants belonging Unreserved Category need to submit application fee of Rs. 200/-. Applicants who belong to the category of reserved & who are willing to apply they have to submit application processing fee of Rs. 100/-. Age of contenders must be between 18 to 35 Years (Post 6). Applying candidates Age must not above than 35 Years (Post 1,2,8), 33 Years (Post 3-5,7,9). Salary to Employees: Shortlisted aspirants for Clerk, Assistant, Instructor will receive pay scale of Rs. 9300 - 34,800/- With 4200/- Grade Pay (Post 1,6,8), Rs. 5200 - 20,200/- With 1900/2800/- Grade Pay (Post 2-5,7,9) which is offered by Bhavnagar Municipal Corporation. Assortment of job finders for above posts will be based on their appearance in Written Exam / Practical Test which will be conducted by Bhavnagar Municipal Corporation on stipulated date. Job searchers who wish to apply for BMC Jobs needs to go on official site that is http://www.bmcgujarat.com. Dead Line For Apply Online : 13-04-2017. Click Here For BMC Job Notification Link. A current advertisement for LVB Recruitment has been published by Lakshmi Vilas Bank. Result oriented and skillful Indian Citizens can apply by submitting application form for the Various unoccupied posts of Probationary Officers before the time limit that is 17th April 2017. Qualification Details: Job searchers should have Diploma / Graduation Degree or equivalent examinations from any recognized board / institute. Aspirants belonging all Category need to submit application fee of Rs. 650/-. The candidate’s age should be in between 20 to 30 Years As On 01-03-2017. Selection of the job hunters will be done on the basis of their performance in the Online Examination, Group Discussion, Interview conducted by the selection committee. Job searchers who wish to apply for LVB Jobs needs to go on official site that is http://www.lvbank.com. Commencement of Online Application Form Is : 29-03-2017. Closing Date of Online Submission of Applications Form Is : 17-04-2017. Click Here For LVB Job Notification Link. Haryana State Pollution Control Board has recently advertised A current advertisement for HSPCB Recruitment to inform the Qualified and talented Individuals for the 53 vacant posts of Clerk, Steno Typist. Eligible Individuals can apply for HSPCB vacancy by filling offline application form before the end date which is 18th April 2017. Qualification Required: Job seekers should have completed the education as 8th / 10th / Graduation Degree with good academic records from well recognised Board/ University/ Institute as per the applied posts. Contenders who want to join this organisation they should be in between 17 to 42 Years. Candidates who want to apply for HSPCB vacancy they are required to go through the official website of organisation that is http://www.hspcb.gov.in. This will open a list of the links having latest openings and candidates have to select the most appropriate link which will open the complete advertisement having further details regarding HSPCB Vacancies. Deadline to Submit Hard Copy of Application Form Is : 18-04-2017. A newest career advertisement with name as Salem District Court Recruitment has been issued by Salem District Court to inform the Enthusiastic and talented Job searchers for the 71 positions of Assistant, Clerk. Eligible Job appliers can apply for Salem District Court vacancy by submitting their applications through offline mode before the time limit that is 12th April 2017. Education Criteria: Aspirants must have 8th / 10th / 12th from well recognized Board/ University/ Institute according to post. Contenders who are interested to apply for any of the above mentioned positions they should be in between 18 to 30 Years As on 01-01-2017. Salary to Employees: Those applicants who will be recruited successfully against Salem District Court they will attain salary of Rs. 5200 - 20,200/- With 2400/2200/- Grade Pay (Post 1-3), Rs. 4800 - 10,000/- With 1300/1400/- Grade Pay (Post 4-10) from recruiting organization. Deadline to Submit the Application Is : 12-04-2017. Click Here For Salem District Court Job Notification Link. An employment notification with name as IITM Recruitment has been circulated by Indian Institute of Tropical Meteorology. Achievement oriented and skilled Indian Nationals have to submit their application form for the 22 vacant positions of Research Associates, Research Fellows till the closing date that is 30th April 2017. Qualification Required: Job seekers should have completed the education as Engineering Degree / Post Graduation Degree with good academic records from well recognized Board/ University/ Institute as per the applied posts. The candidate’s age should not exceed 35 Years (Post 1), 28 Years (Post 2) As on 30-04-2017. Salary to Employees: Those contenders who will fulfill the required eligibility criteria for IITM Vacancies will get a monthly consolidated of Rs. 36,000/- (Post 1) Rs. 25,000/- (Post 2) as per the rules of the organization. Contenders the first and necessary step is to visit the official site of the organisation that is http://www.tropmet.res.in. This will open a list of the links having latest openings and candidates have to select the most appropriate link which will open the complete advertisement having further details regarding IITM Vacancies. Last Date of On-line registration : 30-04-2017. Click Here For IITM Job Notification Link. 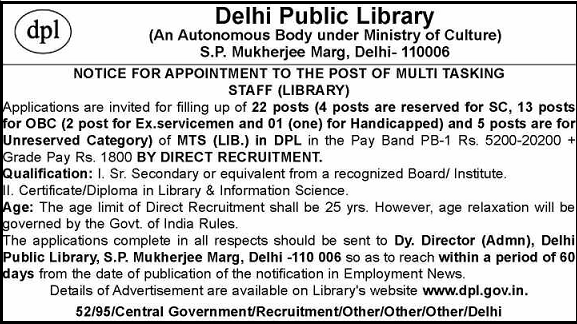 Delhi Public Library has revealed A current advertisement in regard to DPL Recruitment to inform the Diligent and dynamic Individuals for the 22 vacant positions of Multi Tasking Staff. Eligible Applicants can apply for DPL vacancy by submitting application form through offline mode on or before the end date that is 23rd May 2017. Essential Qualification: Job finders should have passed 12th / Certificate / Diploma (Library and Information Science) with good academic records from well recognized Institute / board. Contenders who are willing to apply for above mentioned post they should be below than 25 Years. Emoluments: Successfully appointed contenders against this recruitment will attain salary of Rs. 5200 - 20,200/- With 1800/- Grade Pay from recruiting organization. First of all contenders visit the official website which is http://www.dpl.gov.in. This will open a list of the links having latest openings and candidates have to select the most appropriate link which will open the complete advertisement having further details regarding DPL Vacancies. Closing Date to Submit Hard Copy of Application Form Is : 23-05-2017. 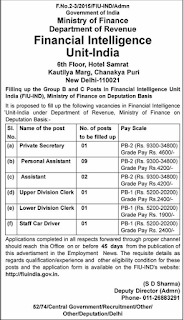 Financial Intelligence Unit has circulated A newest career advertisement regarding FIU Recruitment to inform the Qualified and talented Jobs Hunter for the 15 positions of Assistant, Clerk, Private Secretary. Eligible Job searchers can apply for FIU vacancy by submitting application form through offline mode till the closing date that is 8th May 2017. Salary & Pay Band: Candidates who will be recruited successfully they will get attractive and satisfying salary of Rs. 9300 – 34,800/- With 4600/4200/- Grade Pay (Post 1-3), Rs. 5200 – 20,200/- With 2400/1900/- Grade Pay (Post 4-6) from FIU. First of all appliers you have to open the official site of the organization that is http://www.fiuindia.gov.in. Deadline to Submit the Application Is : 08-05-2017. An employment notification in regard to Tripura Forest Department Recruitment has been professed by Tripura Forest Department to inform the Goal oriented and skilled Individuals for the 56 positions of Forest Guard. Eligible Candidates can apply for Tripura Forest Department vacancy by submitting their prescribed application form before the end date which is 10th April 2017. Age of contenders must be between 18 to 40 Years As on 01-03-2017. Salary Package: Selected aspirants for Forest Guard will get the salary pay band of Rs. 5700 - 24,000/- With 2100/- Grade Pay. Engagement of applicants will be completed against this recruitment on the basis of their presentation in Physical Measurement, Interview that will be conducted by the recruitment panel of organization. First of all appliers you have to open the official site of the organization that is http://www.forest.tripura.gov.in. Last Date to Submit Filled-In Application : 10-04-2017. Click Here For Tripura Forest Department Job Notification Link. Job appliers can also get latest updates about Tripura Forest Department Vacancies by bookmarking this page using CTRL+D. A job notice regarding BRBCL Recruitment has been issued by Bhartiya Rail Bijlee Company Limited. Enthusiastic and talented Job appliers can apply by submitting application form for the 75 vacant positions of Diploma Trainees before the last date that is 26th April 2017. 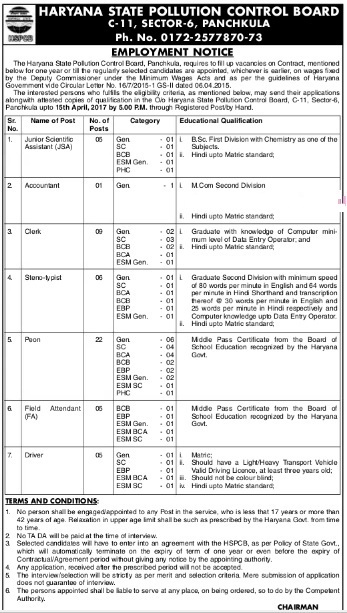 Required Qualification: Those candidates are having minimum qualification as Candidates who are willing to apply for BRBCL jobs must posses Diploma (Mechanical / Civil / Computer and Instrumentation / Electrical / Electronic Engineering) from any recognized board or institution can apply. Candidates belonging to SC/ST/PWD/XSM categories are exempted from payment of application fee. Salary to Employees: Those contenders who will fulfill the required eligibility criteria for BRBCL Vacancies will get a monthly consolidated of Rs. 15500/- (During Training) Rs. 15500-3%-34500/- (on completion of Training) as per the rules of the organization. A Written Exam / Skill Test will be conducting by Bhartiya Rail Bijlee Company Limited to select candidates for above stated posts. Contenders the first and necessary step is to visit the official site of the organization that is http://www.jvdtcareers.net. Opening Date of Online Submission of Application Form Is : 27-03-2017. Last Date For Applying Online Is : 26-04-2017. Commencement of Downloading Admit Card Is : 05-05-2017. Written Exam Date : 28-05-2017. Click Here For BRBCL Job Notification Link. A job notification regarding Office of the Superintendent Simdega Recruitment has been published by Office of the Superintendent Simdega to inform the Diligent and dynamic Individuals for the 800 Vacancies of Assistant Police. Eligible Job appliers can apply for Office of the Superintendent Simdega vacancy by submitting application form till the closing date that is 5th April 2017. Required Education: Job finders should have passed 10th with good academic records from well recognized Institute / board. Pay Band for Office of the Superintendent Simdega jobs: Shortlisted aspirants for Assistant Police will receive pay scale of Rs. 10,000/- which is offered by Office of the Superintendent Simdega. Selection of the candidates is based on their performance in the Written Exam, Physical Efficiency Test, Medical Test which is conducted by the selection panel of the Organization. First of all contenders visit the official website which is http://www.simdega.nic.in. Closing Date to Submit Hard Copy of Application Form Is : 05-04-2017. Click Here For Office of the Superintendent Simdega Job Notification Link. Haryana Seeds Development Corporation Ltd has dispersed A latest advertisement for Haryana Seeds Development Corporation Ltd Recruitment to inform the Capable and Motivated Candidates for the 106 posts of Clerk, Typist, Salesman. Eligible Jobs Hunter can apply for Haryana Seeds Development Corporation Ltd vacancy by submitting their applications through offline mode till the closing date that is 31st March 2017. Academic Details: Those candidates are having minimum qualification as Candidates who are willing to apply for Haryana Seeds Development Corporation Ltd jobs must posses 10th / 12th / ITI / Graduation Degree from any recognized board or institution can apply. Applicants who belong to the category of SC/ST & who are willing to apply they have to submit application processing fee of Rs. 50/-. Pay Band for Haryana Seeds Development Corporation Ltd jobs: Contenders that get shortlisted after qualifying the selection process will get Rs. 16,000/- (Post 2), Rs. 21,200/- (Post 9) as per organisation norms. A Interview will be conducting by Haryana Seeds Development Corporation Ltd to select candidates for above stated posts. Firstly, approach on web portal of Haryana Seeds Development Corporation Ltd that is http://www.haryanaseeds.gov.in. Deadline to Submit Hard Copy of Application Form Is : 31-03-2017. Click Here For Haryana Seeds Development Corporation Ltd Job Notification Link. A latest job notification in regard to MRC Recruitment has been dissipated by Mahar Regiment Centre to inform the Diligent and dynamic Job searchers for the 22 unoccupied posts of MTS, Stenographer. Eligible Job appliers can apply for MRC vacancy by filling offline application form before last date which is 24th April 2017. Academic Details: Candidates must have completed the 10th / 12th / ITI / Diploma or its equivalent with good marks from a recognized University / Institution. Age of applying candidates must be between 18 to 30 Years (Unreserved), 18 to 30 Years (ST Category). Emoluments: Those applicants who will be recruited successfully against MRC they will attain salary of Rs. 18,000/- from recruiting organization. Selection of applicants for MTS, Stenographer Will be based on Written Exam / Interview. First and foremost step you have to take is for opening the official site, which is http://www.mod.nic.in. Last Date to Submit Hard Copy of Application Form Is : 24-04-2017. Click Here For MRC Job Notification Link. Applicants can also get latest updates about MRC Vacancies by bookmarking this page using CTRL+D. A latest job notification with name as TDB Recruitment has been released by Technology Development Board to inform the Enthusiastic and talented Indian Nationals for the 04 unoccupied posts of Scientist, Director or Deputy Secretary. Eligible Job searchers can apply for TDB vacancy by submitting application form till the closing date that is 21st April 2017. Required Education: Candidates must have completed the Post Graduation Degree (Science) / Engineering Degree (Technology) or its equivalent with good marks from a recognized University / Institution. Age of aspirants applying for above Vacancy must be above 56 years as on 21-04-2017. Salary & Pay Band: Applicants who will be appointed against this recruitment they will attain consolidated salary of Rs. 16,400 - 450 - 20,000/- (Scientist 'F'), Rs. 14,300 - 400 - 18300/- (Scientist 'E'), Rs. 12,000 - 375 - 16,500/- (Scientist 'D'), Rs. 14,300 - 400 - 18,300/- (Director), Rs. 12,000 - 375 - 16,500/- (Deputy Secretary) from recruiting organization. Engagement of aspirants will be based on their performance in Interview that will be driven by the recruitment committee of Technology Development Board. 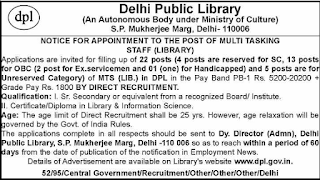 Candidates who want to apply for TDB vacancy they are required to go through the official website of organization that is http://www.tdb.gov.in. Last Date to Submit Hard Copy of Application Form Is : 21-04-2017. Click Here For TDB Job Notification Link. A latest career related advertisement titled as Station Workshop EME Recruitment has been published by Station Workshop EME to inform the Desirous and brilliant Individuals for the 02 vacant positions of Washerman. Eligible Individuals can apply for Station Workshop EME vacancy by submitting application form before the last date that is Within 21 Days. Education Needed: Those job hunters have done the 10th from a recognized University or Institution may apply. Contenders who want to join this organisation they should be in between 18 to 45 Years. Monthly Remuneration: Successfully recruited applicants for Washerman will attain attractive and impressive salary of Rs. 18,000/- from organisation. Selection of applying aspirants will be based on their performance in Written Exam / Interview / Practical which will be conducted by the recruitment panel. First of all contenders visit the official website which is http://www.davp.nic.in. Click Here For Station Workshop EME Job Notification Link. A latest advertisement for Collectorate Simdega Recruitment has been released by Collectorate Simdega to inform the Brilliant and qualified Applicants for the 13 Vacancies of Manager. Eligible Jobs Hunter can apply for Collectorate Simdega vacancy by filling offline application form till the last date that is 31st March 2017. Education Info: Aspirants must have Graduation Degree from well recognized Board/ University/ Institute according to post. Age of applying candidates must be between 24 to 35 Years (Post 1-3), 21 to 35 Years (Post 4). Contender will be recruited against this recruitment on the basis of their performance in Written Exam / Interview which is about to be conducted by the recruitment committee of organisation. Candidates who want to apply for Collectorate Simdega vacancy they are required to go through the official website of organization that is http://www.simdega.nic.in. Click Here For Collectorate Simdega Job Notification Link. Repco Bank is looking for the Ambitious, fascinated and proactive Indian Citizens to fill Various vacant positions of Branch Manager. Recently, Repco Bank has broadcasted An employment advertisement as Repco Bank Recruitment. To complete this recruitment process Applicants who satisfy the essential requirements may attend walk-in interview on 13th April 2017 at the given venue. Qualification Required: Those candidates are having minimum qualification as Candidates who are willing to apply for Repco Bank jobs must posses Graduation Degree from any recognized board or institution can apply. Applicants who are interested to apply for above mentioned post they should not be exceeding than 28 years as on 01-04-2017. Emoluments: Appointed aspirants for Branch Manager posts will get remunerations of Rs. 5.00 lakhs per annum which is offered by Repco Bank. Click Here For Repco Bank Job Notification Link.